In 2013, 20 Muslim girls from Mumbra decided they wanted to play football. This engagement with a sport was a first for them but they were excited at the prospect. They soon realised that while discarding the hijabs for the duration of the game was a concern, the bigger issue was finding a safe space to play. They reached out to Thane Municipal Corporation (TMC) for a solution. After a five-year struggle, the girls finally have an all-women ground. Today, over 147 girls and women from across the city – a majority of who were Muslim girls from Mumbra – played the 3rd Fatima Bi Savitri Bai Football Tournament on that ground. “Mumbra is considered the largest Muslim ghetto in Mumbai and the young girls from the neighbourhood are constantly negotiating to access spaces, be it in terms of education, sports or just public spaces. This ground will not only give them that access but also the confidence to be who they are,” pointed out Sabah Khan, the co-founder of Parcham Collective, a voluntary group that introduced the sport among the girls as a means of reclaiming public space for the women. 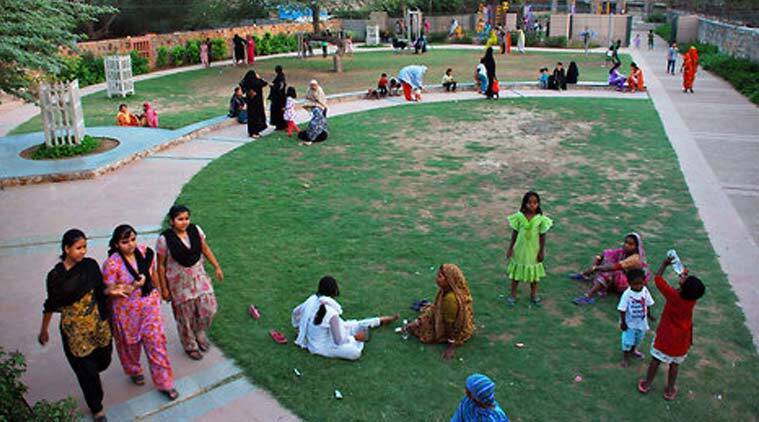 The work on the ground, located on the same plot as Maulana Azad Stadium, is still not complete but that the girls have been handed over a space they can call their own is a reason to cheer. Khan says, “The workers assigned by TMC have levelled the ground using ‘laal mitti’ so that the tournament can take place as scheduled but over the next couple of months, they will be installing toilets, changing rooms, lights and barricades so that the girls can safely play there.” Until the work is complete and Parcham officially takes over its management, the girls will have access to the ground. After some months, they realised the need for a formal, activity-based engagement. That’s when, in consultation with the girls, they introduced football as the activity. Excited about the sport, the participants went to their neighbourhoods, schools and colleges in order to bring on board another 20 girls so that they could properly engage with the sport. “But the 20 new members soon dropped out. The biggest reason was the long wait for a space where they could play. Mumbra was home to Maulana Azad Stadium and several other grounds but in order to use those spaces, the girls had to wait for several hours till the boys wrapped up their game. This, at a time when they were already battling their families and societal pressure to play the sport. That’s when we realised the need for a ground and also a formal collective with its own politics,” recounted Khan. In 2014, Parcham was born. They decided to work on breaking stereotypes based on religion, gender, class and caste and also bridge the gap between Hindus and Muslims in Mumbra. Later that year, Parcham reached out to TMC with an appeal for a women-only ground but not before they had their homework in order. Khan recounts there was a lot of conversation around the Mumbai Development Plan (DP) at the time and Parcham took advantage of this to access the Mumbra DP, where they noticed a lot of empty spaces earmarked for the minorities. “We reached out to TMC with the space next the stadium earmarked for our purpose. To our utter surprise, they instantly agreed, with massive support from Jitendra Awhad, the Mumbra-Kalwa MLA from NCP,” said Khan.